Teaching With Love and Laughter: Classroom Photos...lots of them! I have been loving all the pictures everyone has posted of their finished classrooms. Since my room is finally done, I have some pictures, too. Sadly, the flash in my camera is not working properly, so some of the pictures are a bit dark. I'll be buying a new camera tomorrow because I cannot live without a digital camera. of writing visual aids. You can right click on each picture and open them in a new window. Then, click on the picture again and it will enlarge to show details. This is a picture from my doorway. Please note that these posters have all been updated! This picture shows my writing process posters , 6 traits of good writing posters, and COPS poster. The ones I have in my store have the same content, but with different clip art and fonts. I teach kindergarten, first grade, and second grade writing, so I have color coordinated everything. Red is kindergarten, yellow is first grade, and green is second grade. My students hand in their station work here and their writing notebooks are stored here, as well. Once school begins, they will decorate the covers of their notebooks. My kindergartners keep their poetry and homework notebooks here, and my first and second graders have their writing folders here. First and second grade uses writing notebooks, but they keep their resources in a folder. I tried 3-ring binders and, although I liked that everything was in one place, I couldn't stand the ripped holes and having to put everyone's papers back in when they accidentally fell out. I constantly remind my students to write the best sentences they can and this display is very helpful. I will be giving out star pencils, stickers, and erasers, every now and then, when I catch my students writing 5 star sentences. Please note that these cards have all been updated! My writing topics cards are a huge hit in my classroom. My students love to pick and choose the cards they want to write about and the display really stands out. The clip art is adorable and my students like to copy the images onto their own paper. These pictures show my transition words display and where I'll be hanging my writer's workshop vocabulary words. I hang the vocabulary words as I introduce them to my students. This is my parts of speech display. As the children come up with strong verbs and adjectives, as well as, common and proper nouns that they need help spelling, I'll write the words on cards and place them in the chart. I always start the year off with the names of their teachers and the name of the school already in the chart. Please note that this poster has been updated! This is my meeting area. Showing right now is the poster I use for introducing Jack Hartman's song "Learning Letter Sounds." One child points to the letters as the rest of us sing the song. This song and the various activities that go with the above poster, are extremely helpful in teaching my students the letter sounds. My agenda goes in the blue chart and I write my objective and essential question right below it. The red, yellow, and green pocket charts are for the grade level sight words. I have 5 computers in my classroom. This picture also shows my character education posters. Character education is very important to me and I integrate it throughout my curriculum. This is part of my writing station. My students love writing with a writing buddy and using the large dry erase board. During free choice, they often play teacher-students and it's such a joy to watch them. The table above has all kinds of resources for the children to use while they are writing. Task cards, monthly and seasonal word cards, picture prompts, writing utensils, message books, and much, much more. This display shows my types of leads posters, first grade writing scale, and story questions posters. I refer to these displays every single day. This display has always been an integral part of my writing classroom and when DJ Inkers started offering commercial licences, I jumped on the bandwagon, bought the license, and re-created my writing menu. (Sorry about the bright light covering the poster that says Book. As I stated above, my camera is not working properly.) My students love to choose an item from the menu to work on during station time or when they are done with a different station. There's always something fun to create! These are my students' mailboxes. I typed out their names, laminated them, and taped them to the 2-inch binder clips. The bottom of my mailbox unit holds some fun activities the children can do when they have completed their station work. My kindergarten and first grade writing forms are in there, as well as, word search templates, mystery word activities, etc. This is my mailbox system with color coded baskets. And my rainbow colored drawers that hold all my office supplies. I must remember to label that blue drawer! This picture is of my clip chart and 5 star behavior board. Everyone who ends the day on green or above gets a star. Anyone who ends up off the chart (past outstanding) gets 2 stars. Once they have earned 5 stars, they can choose a treasure from the treasure box. Well, that's it, folks! My classroom is all ready for my 58 students to arrive on Monday. Many of whom are named Isabella! LOL! And, no, I don't teach all 58 at once! Yikes! I hope you enjoyed my pictures and I look forward to seeing all of your classrooms, too. I love your classroom. I have always think that teaching reading and writing to the younger grades it's the most difficult and enjoyable part of my job. If this makes sense It's the most tired part but I think that is where my kids and I spend the best time. You must feel very proud of yourself! Can you tell me the trick to making the poster sized letter chart? I love how big you have it! Your room looks fantastic! I love all of the bright colors! Your students are going to love it! Your room has so much color and ADORABLE clip art!! I'm snagging some ideas too, especially putting kiddos names on clips! LOVE IT! Your room looks so great! Hi Lori! Your classroom looks AMAZING! I just got back the other day from Jamaica (and have yet to go to school - maybe this week?). I still have 3 weeks to go before we start up again. THANK YOU so much for the idea of the binder clips on the mailboxes! LOVE IT! My husband is in the process of making my mailbox as we speak and I was thinking of ways to display the kids names! This will be perfect! I love your room! All the writing resources are amazing! Thanks for linking up! I am loving your room! I really like your 5 star sentences. That is a terrific idea! Your room makes me sooo excited to teach writing. I also like the clips for the mailboxes. That is way better than the current labels I use. Your room looks great! You are so organized and with teaching different grade levels, I'm sure that makes your life easier. I think your students are going to love your space and be inspired to write! By the way, I love those writing topic cards! Your room looks amazing! 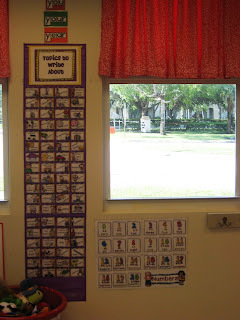 I'm teaching reading, writing/language arts to three different first grade classrooms this year so I loved looking at how you've organized everything...and got a few more ideas too! Your room looks fantastic! I recently purchased your Writing Pack Bundle and have already got your posters up in my classroom! I was wondering where you got your Good Listener posters, your labels for your rainbow cart, and your 1st grade writing scale? Thank you so much for your creativity!!! Lori, it looks fantastic! I love all of the visuals for your students. It is so bright and eye-catching. Happy new school year!! Your classroom looks great! I had that same carpet when I taught Kindergarten, I loved it! Thanks for linking up- your room is so organized and colorful. What a beautiful and well-organized classroom! Kudos to you - I am in love with so many of your ideas! Oh my goodness, I love your room! It is so cute and organized. I am jealous of your space. I have one student computer in my room and I feel like it takes up too much space, I can't imagine having room for multiple! Your carpet area is so cute. your kiddos probably LOVE being in your fun room! 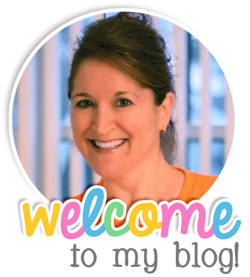 I am LOVING your room and all the great ideas! I am a writing teacher to all our firsties this year. I would LOVE to see your schedule and how you plan your day. I'm only going to have 90 minutes with each class and I'm afraid it's going to F.L.Y.!!! Any tips or tricks???? I just LOVE reading all these sweet comments. Thank you so very much! @Maria: I teach writing for 90 minutes a day to Kinder, then, first, then, second. I do a 45-60 minute writers workshop lesson, which includes a mini lesson, independent writing, and sharing, and then, stations. I also fit it SS. Love your classroom! I am a retired teacher and would go back to work in a heartbeat if I could do what you are doing. My last ten years I taught K-1 multiage where I kept my students for 2 years. What fun for you to get to teach writing to all three levels. Thanks for sharing all of your great ideas! I still tutor and will be "borrowing' from you! Have a great year. I love your classroom. It is so bright and cheerful. Your charts look fantastic. I noticed one of your posters (actually a set of posters) about listening. Is that one of your packs for sale? Your classroom looks so bright and cheery. I love it! SOOOO CUTE! It looks so great! Love your theme! Come and check my classroom reveal out too! Okay how did I miss this post??!! You are so inspiring Lori, I have learned so much from you:)) I am so jealous of all the wall space! It looks fantastic and I hope the year is a fantastic one.